If something goes wrong you have to start it all over again...and cry loud! So, just use the classical paradigm of Map-Reduce: lots of VMs, distributed storage, small tasks that may be computed one by one ….in a parallel pipeline! Usually all computations on data are performed using Databases, that means → historical data, even if a couple of hours old. But now it is possible to catch flying data, that is, surfing the tide from the very beginning! For example, they notice an event from its first signs: tsunamis, traffic jams, commercial success (or flop) of a product/event, and so on. Google is simply the best in handling DATA; it is part of their declared mission and scope. Think about the possible applications of real-time analytics. What if systems became capable to detect events just before or soon after they are happening? Why you will need either historical than real-time data? And what is the role of ML in all that? 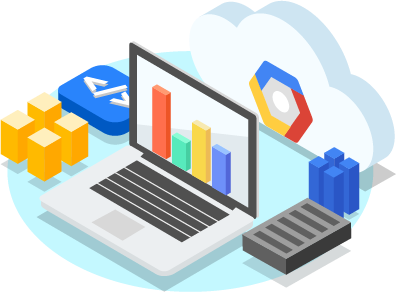 Big Query: Analytics or Data Warehouse or OLAP, as you prefer. It means a DB not really performant for writes (usually made in batches, but it supports streaming, too) but a it is a champion for querying over lots of data. It don’t use indexes but it can activate fleets of server for selecting the data. Storage and storing inexpensive...query paid by weight (TB). DataFlow + Pub Sub: 2 different products that often work together. Pub/Sub is a serverless, large scale, real-time messaging used to catch da data the very moment that it is generated. Dataflow is besed on Apache Beam and it is a powerful way to process big data in steps. It doesn’t store data (uses Cloud Storage or BigQuery to do that). Cloud Dataproc: Hadoop ecosystem in Cloud. If already using Hadoop it is a lift and shift solution. Otherwise, Google advises to use Dataflow and Bigquery. DataLab DataPrep DataStudio are utilities, more or less. Be aware of the names: it is legitimate to think that someone is really lacking in imagination…..
Big Table: officially listed as a noSQL Database, but it is the product to use for IoT Data Ingestion and Time Series semi-structured Data in large quantities. It is a DB because is fast either in writing then in reading. It is the Dr.Strange of DBs. Used by Google for products like Maps and Gmail. At the very base of Google Big Data there is COLOSSUS, Google Distributed File System. if it's unknown to you go and get a look at it. A short clarification: Basic Concepts gives just the intuition of the topic, while the Cheatsheet provides a general overview with lists of organized and structured links with a minimal definition. These links, coming from the official documentation, are to be used for the study, keeping on focusing at the big picture. For any doubt, consult the doc Building Blocks, that has small explanation for any single item. VPC - Virtual Private Cloud is the network space of your activity or company. It is like your actual Data Center, but just in Cloud. Integrated with your IT resources on-premises (local). Before diving into the technical definitions, we’ll get the intuition comparing a Network to a big Sporting Village. Moreover, the village may be connected with other Villages around the World…. Subnets: “boxes” in which resources with IP are placed. Located in different places (Europe USA ecc). Firewall rules: security rules for allowing/blocking traffic in relation to protocol, generic labels and specific addresses. DNS: a network resource may be referred with a number (IP) or a corresponding name. Load Balancers and Availability Groups: behind the IP Address of your website may sit a fleet of Servers. In this case the IP Address point to a Load Balancer that sends traffic to the fleet (Availability Group). Important concept: you have to manage how to organize your data center in subgroups depending on which instance may communicate with each other and how. For example: The finance private subnet may talk only with the accounting private subnet. The public resources may be accessed from Internet only with Https and may ask for data to the DB in the private DB subnet. Think at the IT Infrastructure of your Company or University or Government Institution. How may it fit in this picture? How could it be transferred into the Cloud? What could be private? What public? How? A quick roadmap to all the most important topics. Refer to the doc Building Blocks (links and definitions) for any doubts.